Morocco's Wydad Casablanca booked their place in this season's African Champions League final with a 3-1 home win over Algeria's USM Alger on Saturday in the second leg of their semi-final. Achraf Bencharki's brace sealed the win after Walid El Karti had put the hosts ahead. With the tie level at 0-0 after the first leg in Algiers, Wydad knew they needed to maintain their impressive home record in this year's tournament to overcome their Algerian opponents. The 1992 champions went into Saturday night's second leg having won all five of their matches in Morocco this season without conceding a goal. Wydad opened the scoring in the 26th minute when Bencharki passed to El Karti who volleyed the ball home to give the hosts a 1-0 lead. After the break, the impressive Bencharki turned goal-scorer to make it 2-0 to Wydad with his 54th-minute strike. But the hosts were reduced to 10 men just a minute later after defender Amine Atouchi was sent off for a second yellow card. It made for a tense finish to the game with USM Alger sensing a way back. The visitors made their pressure pay in the 68th minute when Ayoub Abdellaoui struck to make it 2-1 to Wydad, who were hanging on against their desperate opponents. 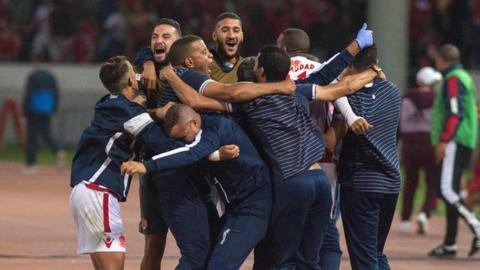 The Moroccans made sure of the victory through Bencharki who hit his second of the game in the 90th minute to give the hosts a 3-1 victory and earn a place in the two-legged final which begins between 27-29 October. Wydad will be contesting their third final, and first since losing to Tunisians Esperance in 2011.